Many woodworkers like to add fluting as a treatment for decorative molding and columns. With a quick change in bearings, you can change the cut depth of this bearing-guided router. 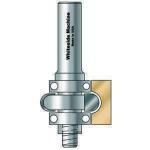 These radius flute cutter router bits are manufactured by the award-winning Whiteside Machine Company. 1/8" 1/4" 1-1/8" 2-5/8" 1/4"
1/8" 1/4" 1-1/8" 2-3/4" 1/2"
3/16" 3/8" 1-1/4" 3-1/8" 1/4"
3/16" 3/8" 1-1/4" 3-1/8" 1/2"